As a kid, I’d push the peas and or onions aside and just eat the sauce! To this day, I’m not sure how I got by with that, but I had a hatred of peas that lasted a lifetime. Until I made an effort to eat them as an adult (ok, just a few years ago) and found out they’re not so bad, after all. Especially when they’re in this lovely cream sauce which def a HUGE step up from the frozen boxed stuff. Hey, all I am sayin’ is give peas a chance! Although they’re easy quick enough to make, Creamed Peas & Pearl Onions really aren’t your everyday ol’ Tuesday night dinner fare; at least not for me when weeknights are usually quick and simple w/o a lot of extra steps. But they are a great side for anything plain (and they were just the thing for that Not Grandma’s Salmon Loaf) and really read as something special if you want to trot them out for company or a holiday like Thanksgiving, Christmas or Easter. These are very good with a cream sauce made with milk, but for a special occasion, I can’t resist a touch of cream added at the end. It takes these Creamed Peas & Pearl onions to a whole ‘nuther level – just a good drizzle of cream when they’re finished makes them rich without being too too over the top decadent! Not Grandma’s Salmon Loaf – with Creamed Peas & Pearl Onions. The onions in this recipe really need a head start so they’re soft and luscious and just right when everything else is ready. I like to toss them in the skillet with some butter and a little water and lid them. When the water is evaporated the onions should be just about done and glazed with butter. If they’re not done to your liking add a bit more water and keep cooking them. The rest is a cinch. Sprinkle the flour over the onions and cook a minute to lose that floury taste add the milk in increments as you whisk. It’s nice to have whisk with tines that are close together so the onions don’t all clump inside it. The peas don’t take long to cook, so toss them in as the sauce just starts to thicken. As far as the peas, you can add a cup or two, maybe even a few more if you want. It just depends how many peas you want and what your perfect pea to sauce ratio is. 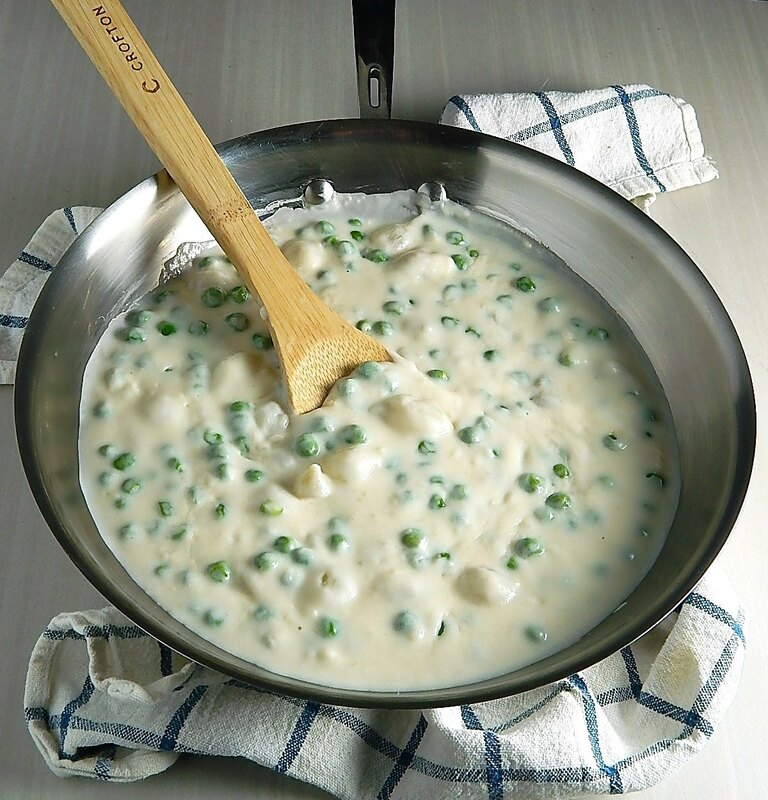 I purposely wrote the recipe so that when the peas are done, the sauce is a little on the thick side – that gives you room to thin with milk if you’d like or to add some cream for richness. Just know that how thick the sauce is in the pan is a little deceiving. Once the Creamed Peas & Pearl Onions cool from molten hot, it thickens so you’ll want to err on the thin side. If you reheat this, do so very gently or it can thin out. While there are some frozen veggies that are just not that great, both frozen peas and pearl onions are some that I use pretty regularly. The both compare price wise to fresh very well and they’re both such a time saver. I’ve never shucked my own peas, but I do know that preparing and peeling those pearl onions is a pain! Watch for frozen vegetables on sale, especially in the fall when the prices are usually lowest (harvest in, warehouses full) and stock up your freezer with frozen vegetables you use; just don’t go overboard. You’ll find prices on frozen veggies rise through the winter and into spring and summer but there will be good sales pretty regularly, often with coupons, if you use them. For basic items like flour, butter, and cream, you really can’t beat Aldi where regular prices usually beat out grocery store sale prices. No Aldi? Get in the habit of shopping holiday sales. Stock up on butter during the winter holidays and before Easter and freeze. Buy cream during holidays if you use it; with the high-fat content, it keeps for weeks. Strategically place the most money on items when they are at the best prices. Using a large, 12″ inch skillet, add onions, butter, and water. Cover with a lid and bring to a boil, turn down to a simmer stirring now and then until onions are just soft and water evaporated. If onions aren’t soft when the water is gone, add a little more, tablespoon by tablespoon. If onions are soft and there is still water, remove lid and let excess evaporate. Add flour, sprinkling over the onions and butter, stir and cook for a minute or two so the flour will lose any raw taste. Add the milk in increments, whisking after each, then bring to a simmer, stirring often. As the mixture just begins to thicken add the peas and continue to cook until the mixture reaches the desired consistency and peas are cooked through, three to five minutes. Adjust the thickness of the cream sauce by adding more milk or enrichen, if desired by a good drizzle of cream. Add salt and pepper to taste. I’ll be sharing Creamed Peas & Pearl Onions at Fiesta Friday #268. Fiesta Friday is co-hosted this week by Julianna @ Foodie on Board and Angie, herself, who puts on Fiesta Friday! This entry was posted in Click here for Fabulous Food Posts and tagged Cream, hearty sides, milk, pearl onions, Peas, Side, Vegetable Side. Bookmark the permalink. Wow! Something new to me but sounds fab! A nice way to dress up peas – I just always assumed it was probably of English origin! Maybe it’s more a German thing! We’re getting on, I have been having some issues with my shoulder, elbow, hands but slowly but surely improving and Chance? Oh my gosh, he is such a sweetheart but still a bit of a head case! I will be by to see you! Online, of course! Dogs!!! I guess just like ppl we gotta love them for who/what they are! YUM! Creamed peas were a favorite of mine growing up, though I seem to recall them coming from a can. Your recipe looks damn good! 🙂 You’ll be happy to know then that I ate the peas and onions and not just the sauce, lol!! Whaaaaat???? Thank you!!!!! Every now and then I want my mom’s salmon patties and creamed peas with pearl onions but I don’t know how to make them. I mean, she’s told me a hundred times but I don’t know…I need like a RECIPE to follow!!! Now I’ve got one. I know what goes in Mom’s salmon patties so I will look at your recipe for salmon loaf and see if they are similar. Thankyou!!!!! I think these are that kind of recipe that everyone does pretty much the same but just adds a little more or a little less milk or cream to get them just how you like them. The only little spin I have is cook the onions more at the beginning because I hate them when they’re crispy and add the peas towards the end so they aren’t mushy! My Mom and Grandma were the worst when it came to describing how they cooked! A little of this, some of that…they’d say. I just hope I can find the frozen pearl onions here in tiny-town Arkansas. My Mom always used the frozen peas that came with pearl onions already mixed in with them. She put those in everything that called for peas.